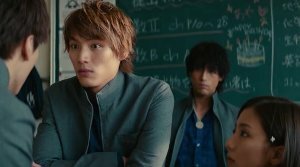 Story: Ichigo Kurosaki (Sota Fukushi) is not a normal student. He can see ghosts. One day, he finds the girl Rukia (Hana Sugisaki) in his room. She explains that she is a "reaper" and that she hunts a "hollow", who are extremely dangerous and restless ghosts. Soon after that, Ichigo finds himself confronted with this creature for the first time. Rukia gets hurt during the fight against the creature and the only way for them to survive the confrontation is for her to give her powers to Ichigo. The boy defeats the creature and from that moment on Rukia stays at his side. She can't go back to her world "Soul Society" as long as Ichigo has her powers. 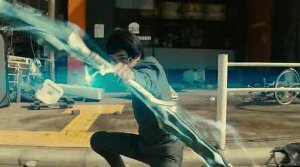 But to transfer the power back would be fatal for the boy right now, he has to get stronger first. Rukia instructs him and from now on lives with him. She even attends the same class as him, which is why pretty soon rumors about the two spread. However, Rukia has other problems, as she will be expelled from her world by her brother and leader Byakuya (Miyavi) if she doesn't get her powers back and kills Ichigo to achieve that. In the meantime, the boy is not reluctant to hunting Hollows anymore, especially the most powerful amongst them, "Grand Fisher", because he has reason to believe that the creature is responsible for his mother's death. But Ichigo has to deal with the overly powerful Byakuya now, as well. ...after all, struggles with its characters, who are not really fascinating. This is strange because the actors' performances are without exceptions pretty good. 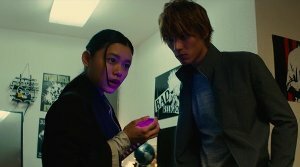 Sota Fukushi ("My Tomorrow, Your Yesterday") fits the role of Ichigo quite nicely and the rest of the roles are very well cast also. 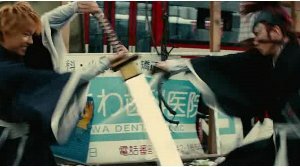 Hana Sugisaki ("Blade of the Immortal") embodies Rukia and thanks to some training sequences and shared moments the chemistry between the two works, too, and Ichigo's development in sword-fighting gets interwoven quite nicely, too. This needs to be mentioned because those scenes kill two birds with one stone and director Shinsuke Sato ("I Am a Hero") manages to combine two or more elements at other moments, as well, and therefore creates an integral whole. However, it's not right to say that Sato sticks completely to the source material. He inevitably has to write his own story to present the audience with as much of the original one as possible. Therefore, there will be some fans who will point out a deviation from the original here and there, but it is hardly noteworthy and can be easily excused. Instead, it is a little problematic, though, that Sato (who is responsible for the script next to Daisuke Habara) puts too much focus on little details, which makes the plot and the characters lack a little bit of depth. 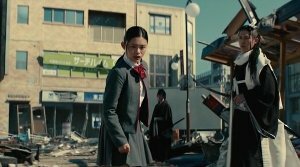 Costumes, sets and special effects are convincing, but the characters, like the cold and calculating Ishida, seem just a little different from what we remember. Chad and Inoue are almost completely omitted and we only get to see them in some scenes at school, where some humorous scenes are delivered. The story around "Grand Fisher", who has Ichigo's mother on his conscience, is strictly speaking also just an embellishment and therefore, "Bleach" seems more like an introduction to the manga's universe. When it comes to the action sequences there are not only good things to mention either. On the one hand, they are rough and fast-paced and are accompanied by a weird (but fitting) soundtrack, on the other hand they lack grittiness and despite a rather nice choreography specifically the finale loses some of its effectiveness because of some fast editting. As I said, the ending might not satisfy everybody and that is the general problem with "Bleach". The director tries too hard to please both fans and newbies. But as should be expected, he only manages to do half of it either way. Manga adaptations have been sneered at for a long time, but this has changed by now because the production quality has improved a lot. 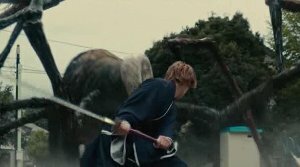 "Bleach" is not one of the best live action adaptations but the movie will manage to please most viewers with its entertainment qualities.